Available on Amazon and Barnes & Noble today. Want to prepare one meal the entire family will actually eat? Get your children to finish their vegetables? Spend more quality time with your kids? 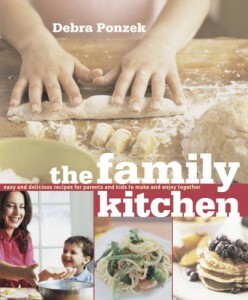 Enter The Family Kitchen, where award-winning chef and mother of three Debra Ponzek shares recipes that are simple enough to please kids, refined enough to satisfy parents, and easy enough for everyone to roll up their sleeves and help make. From Breakfast to Dinnertime, Bake Sales to Vegetables and Salads, Snow Days to Summer Supper on the Grill, chapters include 125 flavorful crowd-pleasers such as Pan-Seared Pork Chops with Green Apple–Cranberry Compote, Honey-Glazed Carrots, and Double Hot Chocolate with Homemade Marshmallows. This is food you and your kids will want to eat every day—and not a smiley-face pizza in sight! While dinner may frequently be over all too soon—cut short by homework, practice, or bath time—preparing meals together in the kitchen can help you steal a little more time with your kids. The kitchen is warm, the pace relaxed, and the conversation easy. Children are also proud of their culinary accomplishments, exclaiming at the table: “I helped make it!” and then diving into a huge portion of those very same carrots they peeled just minutes earlier. Each recipe includes a list of exactly which steps kids can tackle. In addition, there are tips on how to incorporate healthful ingredients and new flavors into a child’s diet; how to make a kitchen safe for children; and how to pull off a kids’ cooking party. The indispensable companion to every family’s favorite gathering spot, The Family Kitchen has a place in every home. Ponzek, mother of three, owner of the Connecticut specialty food chain Aux Délices and a former chef at New York’s Montrachet, aims to extend the time families spend together for meals by assembling the family before they even get to the table. She invites kids into the kitchen to help, teaching them kitchen skills, encouraging them to discover new flavors and bonding with them. Each breakfast, lunch and dinner recipe lists tasks that kids (even little ones) can enjoy doing. The excellent introduction helps children become familiar with kitchen safety and cooking techniques, while the 125 recipes will teach them to cook with seasonal produce and adult flavors. There’s Garden Vegetable Soup with Pesto for lunch, Grilled Spicy Red Snapper Tacos for dinner and Double Hot Chocolate with Homemade Marshmallows for a snow day snack. Selections in each chapter (which include “Picnics,” “Lazy Winter Weekends” and “Kids’ Parties”) range from simple to more complicated, but all contain lessons for willing kids. Although there are plenty of kid-friendly favorites like Patchwork Apple Pie (with scraps of dough flattened by little hands forming the topping), Ponzek’s experience as a chef and mother assures that each dish is homey yet sophisticated.